Now, on the face of it, I can see you saying,”really? another bunch of weight loss tips?” and I answer “yes!” I believe that happiness is good health too. Which is one of the reasons why I started a health blog. Today, I want to share a fantastic book I read recently: Losing It – Making Weight Loss Simple by Dhruv Gupta and Prachi Gupta, founders of the FITHO diet. Again, you are probably thinking, oh, another of those. I confess I thought the same thing, until I started reading the book. The author was kind enough to send me a review copy. I generally tend to take books like these with a pinch of reality and sometimes, cynicism. No matter what, nothing helps you lose weight as effectively as exercise and being conscious of what you put in your mouth. For all that is written about weight loss, what really works is a bunch of tips that we can easily incorporate in our lives. And that is what this book is all about. Has plenty of realistic suggestions to help the reader change her habits. It doesn’t just tell you not to do something, but how to make healthy choices without depriving yourself. Reason no.7 is perhaps the best of all, as the book inspired me enough to take action. I’ve mentioned before that I suffer from infobesity and just love to collect and hoard information. I certainly don’t see myself going on an information diet any time soon, in fact, I can tell you right away that I’ll be an information addict forever. 1. I stopped eating bread. You heard that right. Bread is one of the roots of weight loss evil. I substituted it with chapati – Indian flat bread made of multigrain flour with vegetable stuffing. Oh yes, I got over mourning the convenience of being able to just go buy a pack of bread. If I have to, I buy brown bread, but that too has its hassles. Still, once in a while is okay. Making it a staple is not. My standard meal looks something like this (go on, click and see in full-screen glory) You must have figured out I am a big fan of one-dish meals. 2. I make it a point to drink plenty of water. This book endorsed what I know and have been reading elsewhere – our body can be a traitor and cheat us into thinking we’re hungry when we’re actually thirsty. So, what you think are hunger pangs may just be thirst. Drink a glass of water. Satisfied? Great. Not satisfied? Get a nutritious snack like half a handful of almonds or an apple or a salad. My favorite snack, ably aided by my laziness is a couple of ripe tomatoes or bananas in milk. There are other benefits such as less washing up to do, no preparation and so on. 3. I’ve cut salt and sugar from my diet. This is easy for me as I eat a lot of salads and fruits. I am just fine with little or no salt. Did you know you use less salt when you flavor with herbs and spices like garlic and pepper? It is true. This also means I’ve cut down on pickle, which I adore. I don’t avoid anything totally, because I don’t want to be victim of craving and end up binge eating, I just restrict myself to eating it once a week, and very little. 4. I follow the three-bite rule from the book. When I crave something like cake or chocolate, I take a small spoon of it. I must now eat this in three bites and not just gobble it up. The first bite – enjoy it with my senses and linger over it. The second bite, enjoy the flavor. The third bite, satisfaction. Then go wash the spoon and put it away. Your waistline just thanked you! 5. I have cut down on (gasp!) coffee. My thrice a day, which really translates to much more if you were to measure it with the teeny-weeny disposable cup doled out by coffee vendors, has now become one and a half real cups. I savor each sip and delight in the experience. I am not tempted to overdo it. Strange eh, when you decide to do, it is easy. 6. I make it a point to exercise every day. Nothing amazing – just being faithful to a simple routine: stretches, walking, housework (cooking, cleaning, sweeping, swabbing). I also take the stairs because I learned from the book that it combines cardio. And by the way, getting worked up and breathing hard over not getting your blog post up on time for the Write Tribe Festival of Words does not count. 7. I saved the best for last. I involve my family in everything I do. Highly motivating, great fun with all the teasing when someone slips up and in short, a win-win situation for us. Avoiding breakfast makes you fat. So don’t skip it. Begin the day with a healthy breakfast. Belly fat is the most active and dangerous fat in the body, start losing it now. Avoid artificially sweetened foods and foods with high fructose corn syrup. Forget fad diets such as juice diets, mono diets, low-carb diets, detox and salad based diets. You need a balanced diet. Control snacking between meals to control weight easily. Obviously not an exhaustive list – but I am being faithful to the theme 7. Do I recommend the book? Definitely. I especially love it for spurring me into action and for its fluff-free writing style. What weight loss tips have worked for you? Eating meal at right times also helps. Yes, Bhagyashree – I’ve done that too! Gosh, makes a massive difference! A little is okay, but as you rightly said, it forms the base of our meal as South Indians. Thanks for commenting! Coo tips, some of them I already exercise like , zero bread of scarce brown bread…water-lots of it through the day is excellent, substituting sugary drinks with green tea, smaller portions (2-3 spoonful) of chocolate, pastry, etc. Also almonds, walnuts, apple and grams as snacks. the thing is I have a huge tendency to put on oodles of weight (due to my thyroid condition) so if I waver even a it, it starts reflecting on my health. I diet so I can stay healthy (which is soooo important) …and shape, well, round is…isn’t it? C. Suresh recently posted…A seven day week? Vidya…awesome. I am going to make it a point to follow atleast one of your tips from seven tips that come everyday. So seven tips in total might result in helthier me. sugandha recently posted…Seven places I want to travel to. Thanks so much for some timely reminders. 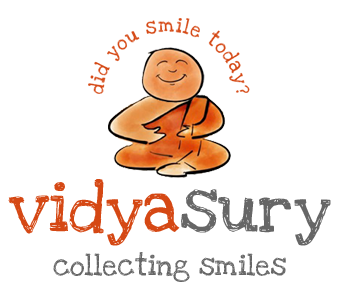 Dear Vidya, thanks for these doable tips which can easily be incorporated into our lifestyle. Vidya your post is really inspiring for people like me. I have tried various diet plans but nothing works. I will give a fair trial to your suggestions. It is in my genes. I many times say that even if I take water, my weight increases, but some people who take loads of ghee/ butter never put on weight. I do a few of these things. I have only brown bread, have reduced my coffee to one cup a day. I need to work on portion control, drinking more water and doing a bit of exercise everyday. That three bite tip sounds very good, have to give it a try. Almost everything that’s shared in the book evokes a deja vu feeling. But as someone rightly said, reinforcement helps. 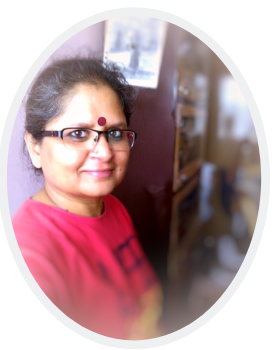 Sreeja Praveen recently posted…7 reasons why blogging is wonderful ! I have never tried to lose weight. But I eat sensibly ,including salads, curd and vegetables and fruits. I have cut down on bakery products. and if its bread at times, its multigrain bread. I bake cake and cookies at home with whole grain wheat flour and home-made white butter. Flax seed chutney with curd is a must with rotis. We eat rice a bit sparingly but love idlis and dosas. Going for walk and yoga practising is a must. want to start meditation.Thanks for introducing the book Vidya. Vidya! Didn’t know about the 3 bites rule. Very interesting and informative. Thank you! Also, about weigh-loss books I have only read Rujuta’s first. Have not found anything better content-wise to pick up. You think I get this? Honestly? The 3 bite rule, here I come – and the world would never get enough of weight loss tips. Thanks, Vidya! Belly fat…BAH! How does one get rid of that monstrosity! Very useful information. And the great thing is – none of it is rocket science! It just requires discipline. Well ,like many others above I’d like to appreciate the three bite tactics. I have few tips to offer myself.Especially since i lost 14.5 KGs doing what I’m about to mention.Moreover i have maintained my ideal weight for one year since losing the extra kilos,doing what I’m about to advise. 1) Firstly drink hot water immediately after any meal. 2)Secondly do eat a light snack every two hours.Eat less in every meal. 3)Finish your dinner by 7.45PM.Do not eat after that. There are more tips,…in case any one is interested. Would love to hear more, Mona. I know about the hot water – it reduces the absorption of fat from the food, right? That is why whenever we have those Sunday afternoons with oily snacks, it is always washed down with hot tea or at least lemon juice to minimize the oil absorption. Dinner at 7.45 – we are very strict about dinner at 8. In fact, I think we owe our good health to eating at regular times in a disciplined way. I find that not combining protein with carbohydrates for 3-4 weeks max. helps me deal with the xtra unwanted inches and no hunger pangs! No fish/meat/cheese with rice/potatoes/rotis/bread but with as many vegetables/salads and vegetables with carbohydrates. No paneer with rice or rotis for vegetarians. Vidya, I’m so happy to see that you found the book helpful, and you’re actually using it in your daily life. Our goal of writing this book, was to provide easy to follow health tips, that will help you make a difference! Prachi, welcome!I am excited to see you here! When I began to read your book, at first I thought it was timing – that I wanted to actually make the changes. But half way through the book I totally fell in love with it. I really enjoyed the logical reasons for all the guidance in the book. The writing style is exactly as I like it – no-nonsense and full of valuable info. And you know what? I am already seeing the changes! Thanks so much! If only I could follow your tips…what I wouldn’t give for a little more resolve! I love the three bites rule, for sure! I’ve realized that depriving myself of something is never the solution, so I just choose to eat it in moderation! Weight is becoming a big issue these days and I liked most of your tips. Especially eating/chewing and not gobbling if a desire. I gotta do that. Bread, seriously!!! What ‘m gonna do now? It’s my main food now a days, along with coffee. I am gonna cut down bread for sure. Thanks for the good reminder, Vidya! Lots of good tips! I hadn’t heard the “three bite rule”. I like it! Thanks for sharing all this valuable info. Great tips. I am working on getting back to a comfortable weight for myself. I exercise regularly, but I have let my diet become one of, oh my gosh I forgot to eat and I’m so hungry, let me shove anything that is around desperately into my mouth until I’m in a coma. Not good. How do you manage to get all this time to read review blog ,reply apart from all else.seems my time magement is poor though weight is Ok I am not skiny and not plump either may be I would have looked thinner but for my height.My weight has been stedy for many years,However probably I am more lucky .I do not overeat ever, I eat small meals but I do eat in between breakfast , lunch and dinner.we do finish dinner around 8.30 but I am awake till 11- 11.30 & I do feel hungry so I tend to eat some thing which I know is wrong . How do you get your family to cooperate in these programmes I find it very difficult as my husband is not a salad person I end up making for mysely & more often than not my deter wanes. As like any other reads this too is interesting. Great information, I have swapped out bread out with low carb wheat tortillas over the last few weeks. I know all of this, but do not do it! Best African mango Supplements has natural supplements of weight loss. It helps you to loose weight naturally without any side-effect. You can do power yoga or any other fitness exercises in order to loose weight. Because along with good and healthy diet, yoga or health exercise will help you to loose weight. Well, these are some worthy tips for losing weight in a natural way. People need to follow a schedule of doing regular exercise, consuming low calorie foods, drinking more water and having a sound sleep. Thank you, Joy! The best way to stay fit are things we ought to be doing as a habit – what you said – enough sleep, exercise and healthy diet! 🙂 Glad you visited! At least I did one in these tips, I finally stopped my coffee addiction and I’m hoping I could do the rest. Diet by far is the most important part of weight loss. If you want to put your weight loss into overdrive you should focus on eating a lot of fruits, vegetables, boneless skinless chicken breasts, egg whites, and salmon. Make sure you get enough protein every day so you won’t lose muscle. Your tips are really helpful for everyone.